Okay, crafters. I’m gonna get real with you here. Crocheting is one of my all-time favorite things to do. That’s why I started a business about it! But it can be so hard on your body. Literally. You probably already know what I’m talking about: hand cramps, neck aches, pains in your elbows and wrists and fingers…the list goes on. This is the nature of the beast, my friends. Crochet (and knitting, too) can lead to some serious health issues such as carpal tunnel syndrome and tendinitis, just to name a couple. It can cause you some serious discomfort and pain, possibly even leading to the need for surgery. Yikes! Today I want to chat with you about a tool that you absolutely MUST have in your crochet arsenal: ergonomic crochet hooks. These hooks will change your life–really! They help to relieve stress in your hands, fingers and wrists. Pair these ergonomic hooks with better posture and proper support for your neck, back, shoulders and arms, and you can revolutionize your craft time. There are dozens of them to choose from, -so I decided to list out for you my top 3 ergonomic crochet hooks. After reading through this list of hooks and pros and cons, you’ll have a better understanding of which crochet hooks I prefer and why. I want to help you choose the best ergonomic crochet hooks for your personal use! Seriously, there are so many options to choose from; it can feel overwhelming to choose a single hook from so many good options! Let me help narrow it down for you. 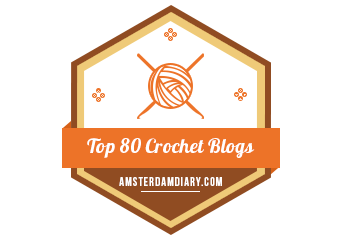 These are my top 3 favorite ergonomic crochet hooks ranked from good to ah-mazing. I’m not going to lie: these hooks are pretty great. They’re pretty affordable (making them a nice step up from your average Bates or Boye hooks), retailing for about $7.25 if you buy them from Clover’s website ($5.15 on Amazon here). The Soft Touch hooks come in sizes from B/2.25mm to J/6mm, so you can get through most of your crochet patterns with a single set of these particular hooks. Clover also has a set of Soft Touch steel hooks ranging from a size 0/1.75mm to a size 14/0.5mm, so you can work with small threads, too. And lastly, these Soft Touch hooks are incredibly lightweight for an ergonomic hook, which I believe helps lessen the strain on your hands. Ergonomic win! But if you want a larger hook, you’ll have to shop elsewhere. At the moment, Clover does not offer any hook size larger than a J/6mm hook in the Soft Touch line. Bummer. Also (and this may just be me), I have found that the grip size and locaion on these hooks fits a little awkwardly for my hand. I have small hands, so that may be the problem, but I find that in using the knife grip I am having to reach further up the throat of the hook in order to work with my yarn, which places the grip in an awkward position in my hand. Next on the list is a hook that I think is perfect for every day use: the Clover Amour hooks! I love these hooks because, like their Soft Touch sisters, they are affordable, retailing for $7.25 via Clover’s website (about $5.60 on Amazon here). Like the Soft Touch hooks, Clover offers a line of Amour steel hooks ranging in size from 0/1.75mm to a size 12/0.6mm. Unlike the Soft Touch, the Amour hooks come in the standard size range from B/2.25mm to a whopper of a P-Q/15mm! I personally own every single one of these standard size Amour hooks (even the large ones), and I use them pretty much always. They fit perfectly in my hands and the thumb grip is in a perfect position for my knife grip. And bonus – they’re color coded! Each hook is a different bright color, which means you can easily spot the hook you need. For instance, I know right off the top of my head that the G/4.0mm hook is purple, wheras the D/3.25mm hook is a sort of tangerine orange color. How awesome is that? If I had to pick something, I’d point out that these hooks are not as lightweight as the Clover Soft Touch hooks. But if anything, I think that makes them balance really well in your hand. So, win-win? The best ergonomic hook I can recommend is the Furls Heirloom hooks. These hooks are simply gorgeous, and they really are the most ergonomic hooks I have worked with. These hooks could (and should!) win beauty contests. They come in lots of sizes (admittedly not as many as the Clover hooks), and you can build your own custom hook with size and wood type/color, so you can get pretty much exactly what you want. Furls also releases limited edition hooks, which come in different woods and are drool-worthy. All of their Heirloom hooks are backed by a 100% satisfaction guarantee AND a $500 hand health guarantee. Trust me, you can tell when you pick up one of these beautiful hooks! The teardrop shape makes them fit perfectly in your hands, and no matter your grip style or where along the throat of the hook you grip, these hooks are pure fairy magic, my friends. I hope this post has helped shine a little bit of light on the topic of ergonomic crochet hooks. As I said before, there are so many options to choose from, and it can be overwhelming when trying to find a hook that fits your needs. Now that you know my top 3 favorite ergonomic hooks, here’s my advice: give them a try! You probably won’t be able to just sample one of the Furls Heirloom hooks (*ahem* I’d love to “sample” an Heirloom hook in a size K, please! ), but you can spend a couple extra dollars on one of the Clover Soft Touch or Amour hooks. Buy one in your favorite or most-used hook size and try it out. UPDATE on 7/17/18: Since this post was originally written, I have also tried the Furls Odyssey and Furls Streamline hooks…and they’re great! If you want to read my reviews of these hooks, please read my Crafter’s Guide to Crochet Hooks here (just scroll down a little ways until you get to the hook reviews). It may take several rows to get used to the new grip/feel of the ergonomic hooks. It may even take weeks to notice the ergonomic benefits. Personally, I knew within 15 minutes of using the Clover Amour hooks that my life was going to get better. I hope the same for you! DISCUSSION POINT: What ergonomic hooks do you like best? Do you have a favorite? Are there some you just won’t use? Leave a note in the comment section below this post and let me know what you think! Click here to sign up for more geeky (and yarny) goodness! I love my clover amour set, I started with a cheap metal set and then got a cheaper version of the amour set but I can’t even compare them. So comfortable, best set of hooks for me. Same! They’re the hooks I use every day, no matter what the project is I’m working. They’re just all-around great! I didn’t think I needed ergonomic hooks, until I tried making my first amigurumi. That tiny aluminium 2.5mm hook HURT! I’ve not actually tried any of these, although the Clover Amour are on my Christmas list. If we get a very nice Christmas bonus from work I might even splash out and buy myself a Furl. Thanks! I love to crochet and used to be able to crochet as long as I wanted. After having a cyst removed from my thumb it has become painful, though. Do you have any suggestions for the hand you don’t hold the crochet hook with? My left hand cramps up and hurts after crocheting. Hi Pamela! I have the same problem sometimes. I find that stretching helps, and if I crochet at a slower pace, I can check to see how tight my non-hook hand. If it’s tight, it’s time to stretch or take a break! I love my clover amours! I buy sizes as I need them so I’m building up a collection. Same, MrsCraft! I usually end up losing mine, then I buy more in that size, and then I find the others again–so I have lots in the sizes I use the most! Just what I was looking for! I love my Clover Amour hooks but am curious about the Furls. Have you tried the streamline or odyssey versions that would be a little more pocketbook friendly? I’m with Pamela; my left hand hurts from gripping my project too hard, but when you are on a roll or a deadline, it’s hard to stop and take a break! I tried the Clover soft touch, but I felt the head shaft was too short and couldn’t hold more complex stitches that have lots of loops, and it inhibited my hooking rhythm. Happy crocheting to all.